A Norwegian Elvis Presley impersonator has set a world record by singing the rock'n'roll legend's hits non-stop for over 26 hours. Kjell Henning Bjoernestad, 35, belted out his Elvis renditions in a local bar for a total of 26 hours, four minutes and 40 seconds. Bjoernestad, 35, told Norwegian radio station NRK: "This is just fantastic, I can't find words for it." 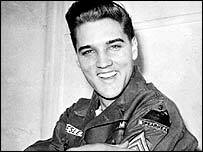 The previous record was set by British Elvis fan Gary Jay, who sang for 25 hours, 33 minutes and 30 seconds. Bjoernestad, dubbed "Kjell Elvis", had planned to sing 100 of Presley's songs for over 30 hours. But he gave up shortly after he realised he had broken the previous record. The Norwegian was also once awarded a prize for being the best Elvis impersonator in his area.